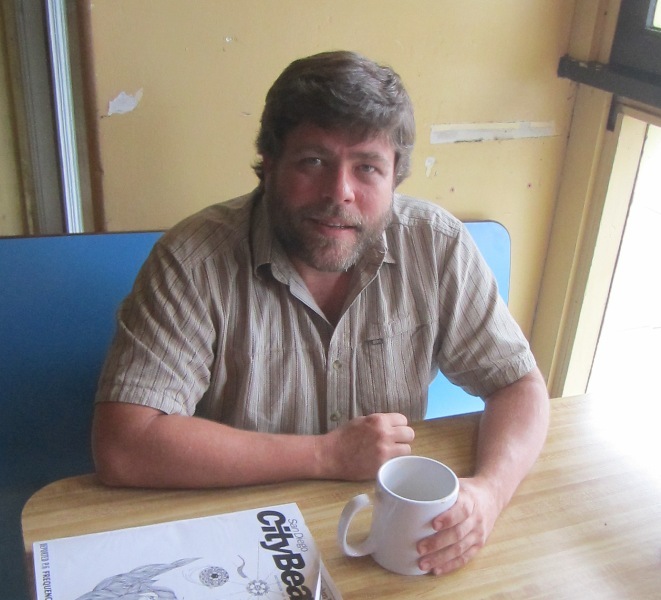 After a brief respite from them, I was back on the trail for my series of “random” interviews of OBceans when I entered NewBreak coffee house on Abbott the other day. It was hot in the rest of the County of San Diego, but in OB it was a windy – almost cold day – and I was looking forward to my steaming mug of java. 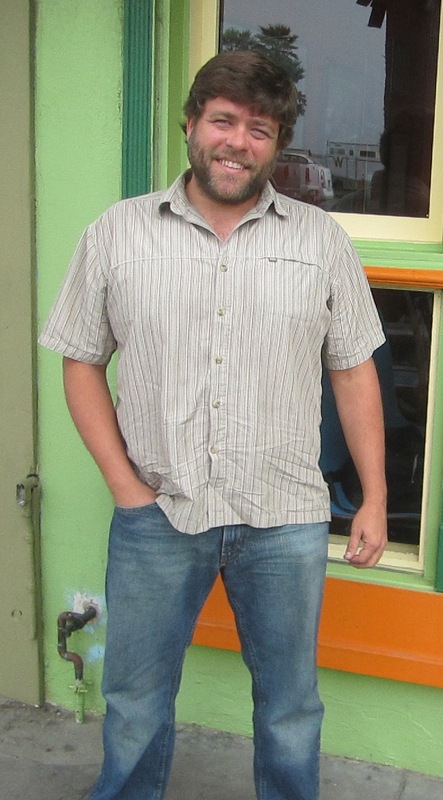 Aaron had been living over on Pescadero for about 3 years, when he moved in with good bud, Mike Stevens, on Lotus Street about 6 weeks ago. “Do you work or go to school?” I asked. Aaron – who looks younger than his 4 decades – definitely works. He’s an independent computer contractor, a mapping and spatial analyst. A what …? He then launched into explaining that he is a contractor for a firm called Tierra Environmental, and works on cultural resources, mainly of local Native Americans around the windmill project out on I-8. He manages the data collected in the field near the giant windmills – artifacts and rocks located with exact GPS positioning; he records and maps this data. Aaron set the program up with a spatial data base. They – the people out in the field – find such things as agave roasting pits Indians set up over the last 1,000 years, or projective points, or meta-volcanic rocks that are good chipping rocks for tools and weapons, and locate them exactly with GPS, then forward all the info to Aaron. He maps out the locations, types of artifacts, etc. This was fascinating. Over the years, researchers have found between 40,000 and 50,000 things – human bones, rocks, and other evidence of human use of the area- the windmills are near burial areas – whose exact locations are secret to prevent thefts. With at least one artifact per site, Aaron explained, there’s over 400 sites. One site is more than a mile across. Aaron has been working in GIS – geographic information systems – for the last 6 to 7 years – primarily with engineering firms and biological resource companies. With an engineering degree in ceramics engineering from a small college in South Carolina (Clemson University), Aaron has completed the course work for a Masters in GIS here at SDSU. Originally from Oakland, California, he left for the Phoenix area when he was 5 – his dad was in large construction, like Bectel. His mom was an Emergency Room nurse. They both still live in Prescott, Arizona. They stayed in Phoenix until his father moved the family to South Carolina when Aaron was in high school. He finished high school and college in SC. He got his first job out of college, he remembers, in Denver – which is where he moved in 1996. He ended up back in California when he found employment in Temecula for nearly a couple of years. Aaron moved to San Diego for a job in 2001. And in 2003, he moved to OB, to West Point Loma. He’d checked out PB – “I’m too old for PB,” he said. Aaron does want to make a transition, he confided in me, out of cultural resources mapping, “into more of web-based mapping applications, specifically building mobile campaign tools – for electoral campaigns.” This type of program can be handled right there on your smartphone or ipod – where you could find all kinds of research done on voters as you go about your campaign, either door to door or other outreach. “Data entry information into your smartphone, eliminates paperwork, waste of hours, human error”, Aaron said. He had thought this all out and was already making programs that would do all this. Our discussion drifted into politics. “I’m warming up to [Mayor] Filner,” Aaron said. He didn’t vote for him. “I think anyone who votes purely on party is a fool,” he said. “I don’t think the system is fair. It’s slanted for Democrats or Republicans.” He’s an independent he said. Aaron also said that he felt “gentrification goes with capitalism”, saying the word “capitalism” with some disdain. But he thinks people ought to get back to more of a trading and barter system. “Get away from a currency exchange,” he said. He’d rather like to see “a manager-based Craigslist for produce,” a system based on need by design. Use the web to trade tomatoes for some other vegetables, or whatever. “I have no drive to be an employee, no drive to work 9 to 5”, he said. “My best days I don’t even get in my car,” Aaron declared to me. “There’s much less stress now,” working from home, he said, without having to drive somewhere to work. 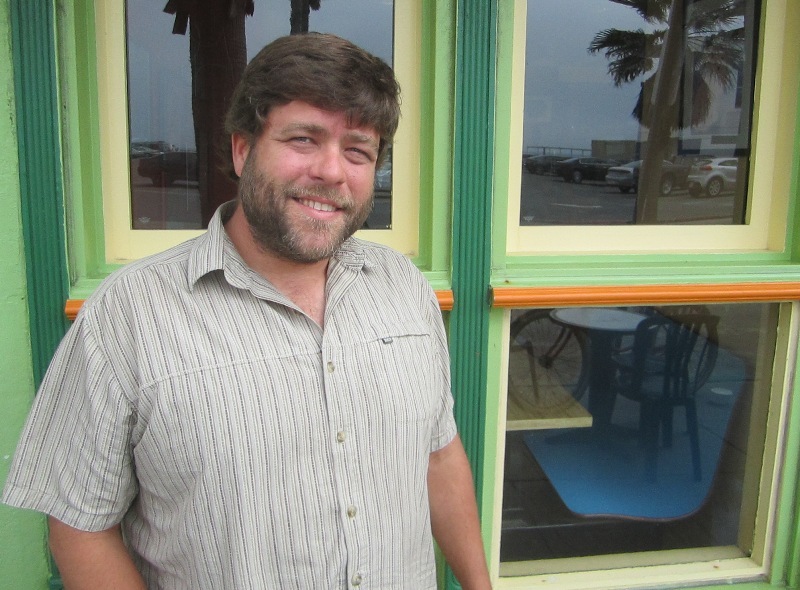 “OB is the best community in town – the sense of camaraderie,” Aaron said. “The neighborliness – is that the word? It has the best sense of community,” Aaron Sutton said. Aaron, when you see this, please contact me at obragblog@gmail.com – thanks, Frank. Anybody ever tell Aaron he looks like Srgt Carter who was played by Frank Sutton? Older Article: Should We Be Outsourcing Public Higher Education in California?